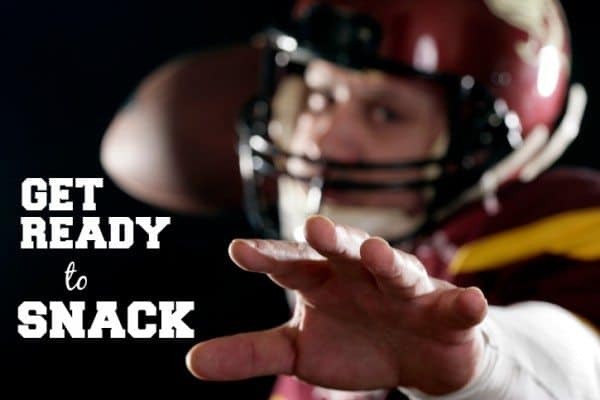 Are you ready for some footbaaaaaaaaaaaall?? What’s that…? You’re just here for the snacks? Relax—me, too. I mean, football’s fine and all, but every red-blooded American knows that the Super Bowl is really about eating all sorts of delicious dips and finger foods on a Sunday afternoon and nobody thinking you’re pigging out. Whether you’re hosting or just bringing a dish over to a friend’s house, it’s worth thinking about your snacking style and goals. (Goals! See what I did there? Because it’s football!) Do you like your foods classic, or do you like a twist on the usual? Are you content to indulge or do you need something with less guilt? Don’t worry, I’ve got you covered with all your favorites. 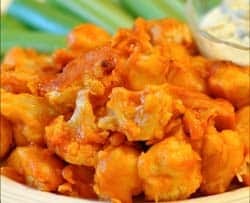 Nothing says “Super Bowl Sunday” to me more than the good ol’ buffalo chicken wing, and don’t get me wrong—I’ll take a plateful, preferably with a side of bleu cheese dressing. They’re delicious! The problem is that the poor buffalo wing has landed on several of those “Do Not Ever Eat This Completely Nutritionally Void Food Ever ZOMG” sorts of lists, lately, and with good reason. If you’re eating a deep-fried chicken wing slathered in fat, it’s not health food. Still, the Super Bowl comes but once a year. If you must have wings, world without end, amen, please use Alton Brown’s buffalo wing recipe, because—although somewhat fussy—this recipe is 1) the only way to get crispy wings without deep-frying them and 2) perfection. Steaming and drying the chicken seems like overkill, I know, but do it once and you’ll see. There’s no going back to any other method after you’ve done this one. In truth, I don’t know that this dip is any healthier than a deep-fried wing; certainly you’re trading some frying fat for dairy fats when you take your buffalo wings in dippable form. On the other hand, I like to make a giant crock pot of this and then serve it with celery, which is basically calorie-free, and feel virtuous. My favorite version comes from the Crock Pot Queen herself, Stephanie O’Dea, and her buffalo chicken dip recipe couldn’t be easier. I bake off chicken breasts in the oven to use for this, and then I tell myself it’s practically healthy because the chicken is good for you. (Don’t look at me like that. Justification is kind of my thing.) A word of warning: Don’t try to use low-fat anything in this recipe (cheese or dressing). The fat is what melts in hot dishes, and low-fat things melt in sad and unexpected and disgusting ways. Trust me. If you’re a person of a certain age, like me, you remember your folks throwing a cocktail party for the grown-ups, and the star of the show (from your kid perspective) was the vat of cocktail weenies in spicy-sweet sauce. Dated? Yes. Totally cliche? That too. Delicious? Yes ma’am. I know there are a million recipes out there, but if you want the cocktail weenie of your youth, Hungry Girl has the unadulterated original and I say, why mess with perfection? If you have toothpicks with cellophane fringe at the top, well, you’ve just brought back childhood. Listen, I know that as long as there has been refrigerated dough in a can, there have been hot dogs wrapped in crescent rolls. I’m not casting aspersions if pigs-in-a-blanket is your thing. But making your own dough—while not as easy as opening a can, sure—is really easy, and it tastes so much better. 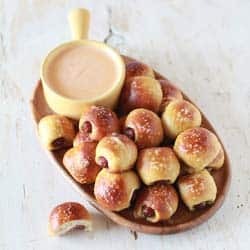 The best I’ve found so far (based on my family’s reaction; I can’t eat this yummy dough) is The Noshery’s pretzel dog bites with beer-cheese dip. 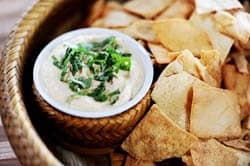 This is simple to make (do the dip and dough ahead, then bake the bites before the game), looks like you’re fancy, and is the quintessential game-day appetizer. I’m a huge fan of black beans, and if you want something a little different, try this black bean hummus recipe for a variation. You will be tempted to leave out the Greek olives, perhaps, but let me tell you that that would be a grave mistake. Even if you don’t like olives, they add a certain quality to the flavor here that makes the dish special. You can pulverize them into oblivion if you’re not a fan, but use them. (I made it only once without them, because I forgot I was out. Never again!) Want to take this one to the next level? Use lime juice instead of lemon. You can thank me later. If you’ve never had baba ganoush—a traditional eggplant-based spread—think of it as hummus made with roasted eggplant. The canonical directions can be found everywhere, though I like David Lebovitz’s version, because he emphasizes the charring of the skins for a smokey flavor. 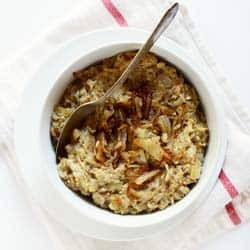 You can’t go wrong with his recipe, but if you’re feeling adventurous (and you love caramelized onions), try the Minimalist Baker’s creamy Persian version (pictured), which skips the tahini and brings a whole lot of onions to the party. Yum. If you have a Super Bowl snack recipe that never fails to please, hit me up in the comments. I’m always looking for new party foods! Thank you for posting a non-tahini baba ghanoush recipe! My daughter is allergic to sesame seeds, but oh how l love (and miss) baba ghanoush! A couple of years ago, when MardiGras was early, I made jambalaya. It required a bowl and a fork, but the crock pot was empty before the game ended! But but but – you have to have at LEAST one Velveeta based dip. Or else it’s not the Super Bowl. Once a year, and only once a year, I make Velveeta with Hormel chili served with Fritos.